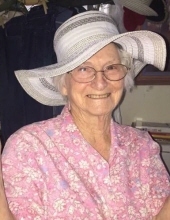 Jo Ann Logan passed away peacefully into the arms of her savior on March 19, 2019 while surrounded by loved ones at Riverstone Hospice Home. She was 87 years old. Jo Ann was born February 12, 1932 to Asa and Ima Pace on a citrus farm near the Rio Grande in Weslaco, Texas. She grew up with her sister Helen, her brother J.W. and her other sister and “best friend,” Pat. It was there, in the southern tip of Texas, that she also met and married George, her beloved husband of 63 years, and started their family of 3 children. George was an Air Force pilot, and they spent time in various parts of the country including Texas, South Dakota and Montana. Jo Ann somehow managed to find home and friends everywhere they went. Jo Ann spent most of her time raising kids during the early years of their marriage. George, Evelyn, and Vincent kept her quite busy. When she wasn’t busy cooking, she was just trying to keep George from shooting off a limb or starting fires, and Vincent and Evelyn from stealing 8-track players. She and her husband undertook many different business ventures. They owned a convenience store, the Pit Stop, in Forsyth, MT for a number of years. They also owned a repair shop and towing company, a trucking business, and even a drive-in movie theater. Jo Ann worked for a time as a CNA in Forsyth. Jo Ann enjoyed being in the presence of animals. She raised Rottweilers and Schnauzers for a short time, but, more than anything, she loved horses. She had a keen eye for show horses and knew a champion right away when she saw one. Her first horse, “Easter,” a large quarter horse mare, got her started. She soon had another, “Dunny” and fell completely in love with horses and horse shows. At some points in her life, she owned upwards of 15 horses at a time. She eventually started raising Appaloosas as well, competing with her son Vincent and their prize Appaloosa gelding “Print” in Montana, South Dakota, and North Dakota. Once, when she had many horses, their show trailer got so large that George had to build an old 65 Chevrolet 1-ton pickup with a corvette engine in it and special browning gear box just to pull it around. Later, she would show paint horses, often winning 1st place and grand champion with her beloved horses Chip, Jazzy, and Ace. During that time she also taught her granddaughter Alea to show and ride as well, making many great memories. Jo Ann had many things in life that she filled her free time with. She loved to ride her horses and spoke of fond memories of riding about the countryside and through the hills. She loved fishing too. Jo Ann and George would take their boat to nearby lakes and spend some of their most enjoyable days on it, often taking their children, grandchildren, and nieces and nephews along to enjoy the outdoors with them. She loved hats and jewelry of all sorts. She had hats for every occasion and outfit. She also loved to read and would read just about anything, but really enjoyed “raunchy” romance novels and mysteries. Jo Ann’s lively spirit and outgoing personality will be missed by many. She often talked of loving her savior and has now found solace in his arms and riding through the fields of Heaven with her son and brother. To send flowers or a remembrance gift to the family of Jo Ann Pace Logan, please visit our Tribute Store. "Email Address" would like to share the life celebration of Jo Ann Pace Logan. Click on the "link" to go to share a favorite memory or leave a condolence message for the family.